When they stop selling your favorite cookie, you can still enjoy the flavors with my Samoa Strawberries. 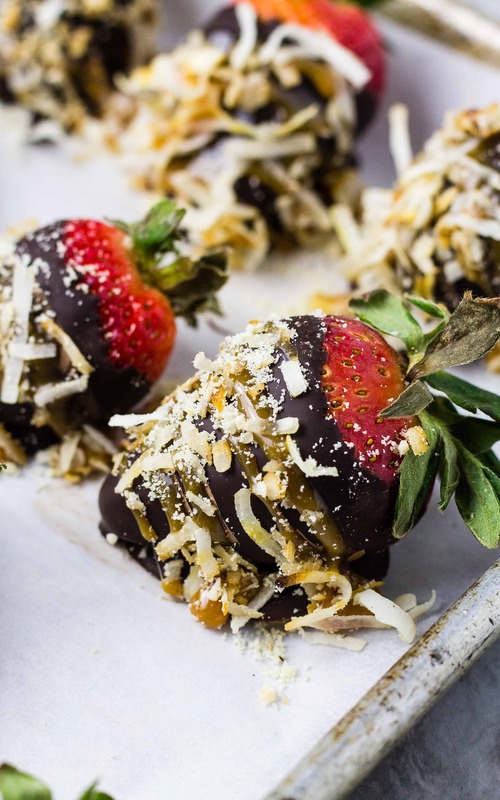 Plump strawberries dipped in chocolate, sprinkled with toasted coconut and shortbread cookies, and drizzled with caramel! Spring means renewal, organization, cleaning out the old and ushering in the new, but it also means… GIRL SCOUT COOKIES! In particular, Thin Mints and Samoas. I know the names have changed since I sold them 1,054 years ago, but you can’t get me to say Caramel deLites. Those delicious shortbread cookies covered in caramel, coconut, and chocolate will always and forever be known as Samoas. Or is it Samoa in the singular? I guess it depends on how many I am cramming in my mouth at one time I guess. What do you do when you run out of cookies and you can’t wait another 300 days till the young ladies start ambushing you outside the grocery store? 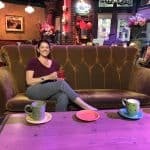 Make substitutes! I can tell you that I usually buy extra boxes and hide them in the house. For the past two years, we have been abstaining from buying Girl Scout Cookies in order to build up our willpower. It worked last year if you count that I only bought two boxes of Samoas and ate them when Brooks was out of town. This year I stayed strong until Brooks bought 4 boxes of Thin Mints. He’s trying to cheer me up for sure! My Thin Mints are tucked away in my freezer like all good Thin Mints should be, but the Samoas I bought after it was clear that we were buying cookies again, were eaten within 2 hours of crossing the threshold of the house. I started dreaming of ways to get the flavors of the Samoas while dreaming about opening day in the Girl Scout Cookie League. You can buy a knock-off or “Bo-Bo” brand, but they are never as good as the original. My Samoa Strawberries are pretty close too, plus you get some fruit! Not only did the scouts change the name of the cookie but there are some technical/culinary differences. Samoas are made with dark chocolate and have more caramel on top of the circular cookie. The new Caramel deLites use milk chocolate and have less caramel on a hexagonal cookie thus bringing out more of the cookie flavor. Poo to that, I want more caramel and dark chocolate!!! 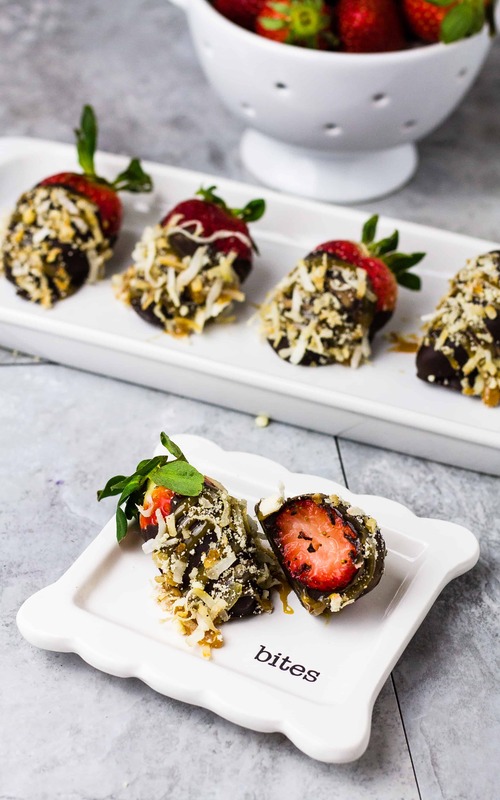 You can see from my Dark Chocolate Bark and Dark Chocolate Peanut Butter Cups that I love dark chocolate and my Magic Cookie Bar Bites have the chocolate AND the coconut and caramel! Grab a dozen or two plump ripe strawberries. Dip each one in dark chocolate. Dust with toasted coconut and shortbread cookie crumbs. Drizzle with melted caramel to seal it all together. All the flavors of my favorite Samoas, even when it’s not Girl Scout Cookie season, so you can be free to indulge right out in the open! No need to hang out in the closet, hide your cookies in empty boxes of high bran granola, or however you snack in private. 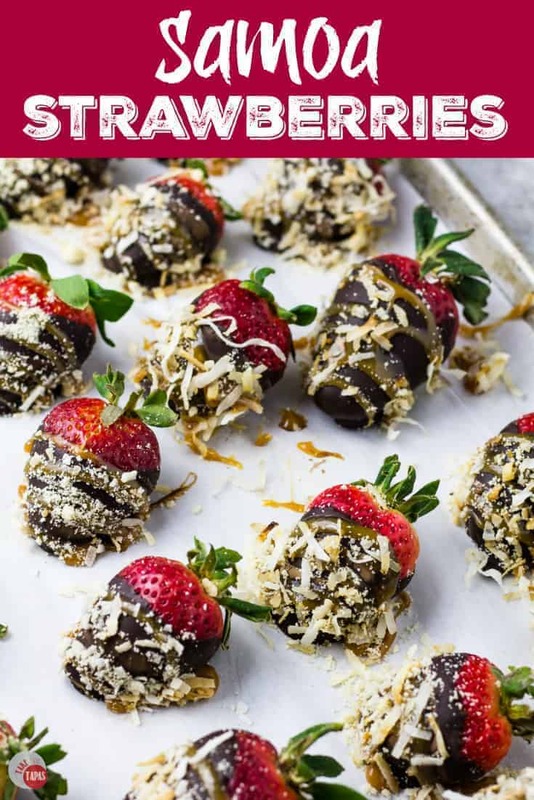 You can have my Samoa Strawberries all year long without waiting for the ladies in green selling cookies! 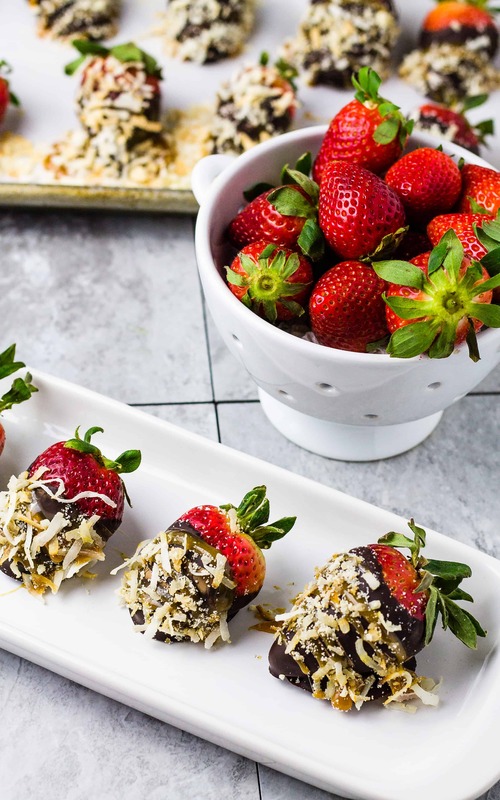 Samoa Strawberries and plump strawberries dipped in chocolate, sprinkled with toasted coconut and shortbread cookies, and drizzled with caramel! Microwave your chocolate wafers/chips at 15-second intervals or use the double boiler method until chocolate is smooth and creamy. Melt your caramels with a tablespoon of water in the microwave at 30-second intervals until the caramel is smooth. Dip 3 strawberries in the melted chocolate and place on the parchment-lined sheet. 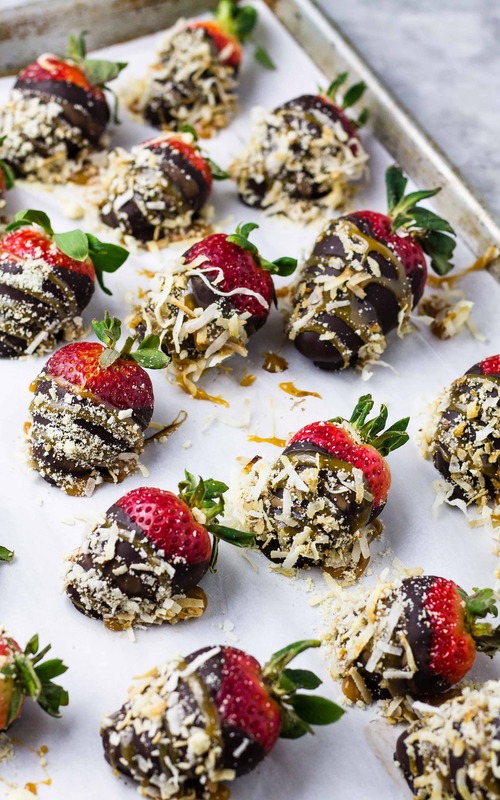 While the chocolate is still wet, sprinkle with shortbread cookie crumbs and coconut. Continue with another 3 strawberries until all 12 are finished. 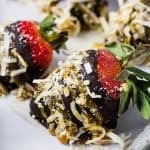 Once all the strawberries are dipped and sprinkled, place the tray in the refrigerator to finish setting the chocolate. Once the chocolate sets completely, remove the tray and drizzle all 12 with caramel. Place the tray back in the fridge to set the caramel. Wow So lovely lovely post! Strawbery looking so tasty.